Spring seems finally to be here, almost a month late. When I go over my photos from past years of the chorus of spring frogs, they are usually in full swing toward the end of March. This year they have only been really active in the last few days. There have been thin layers of ice on the small ponds most mornings until now. I can only try to imagine the suffering of cold so many animals go through just to stay alive. It is unimaginable. And the spring flowers have waited all this time to pop, and now they all coming at once, which makes seeing them all, much less photographing them, a hurry-up process, and so on. 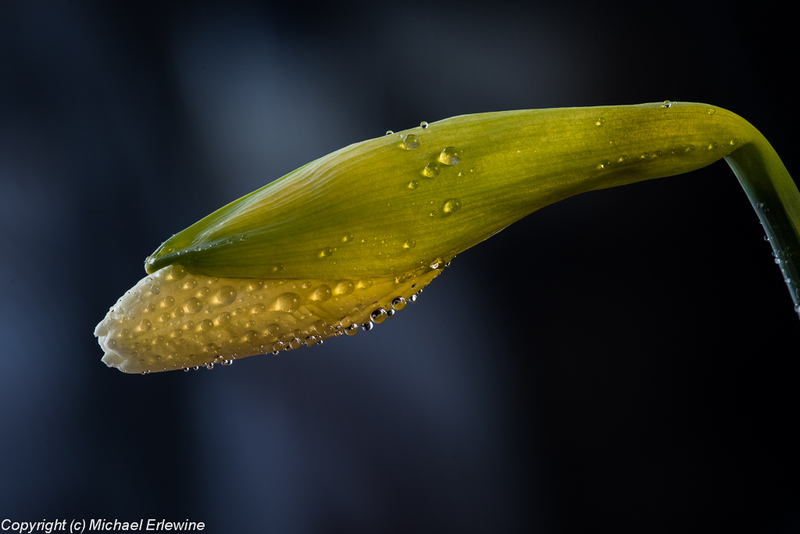 Here is a daffodil bud in my yard taken yesterday with the Nikon D800E and the Voigtlander 125mm APO lens. Don't forget we are in an extended intra-eclipse time lasting about a month and a half. I am not saying that there are no outer eclipse effects, but I tend to follow the Tibetan view that eclipses mark times when the inner subtle bodies all come together and clearly line up or align themselves within us. This alignment marks a change from these centers being unaligned as they otherwise are most of the time. Perhaps we like to think that change precipitates sudden external events, but in my experience that only is true if we neglect to respond to inner change with the appropriate measures. My experience with change, limited (of course) to my personal experience, suggests that inner changes or realignment bring clarity in which decisions can be made that only later will result or can be measured in the external. I could be wrong in this, since I tend to focus inside more than outside. And I tend to associate deep inner change with intense solar events (like solar flares), eclipses, and various major astronomical events. Core change of this kind, for me, is more like setting or rearranging the sails on a boat, taking a different tack or approach. These inner adjustments, once made, eventually result in our going in an alternate direction. In other words, inner change marks a change in attitude or approach more than a sudden outside event. However, failure to note and adjust our attitude can result in physical consequence, i.e. external events. The result of attitude changes, changes in approach, seldom are evident at once, but gradually appear as the two courses, the old and the new, veer apart. Eclipse changes, in my experience, become apparent down the road, over time. But they are (or can be) made now, while the eclipse alignment holds, and there is sufficient alignment and clarity to see how and what changes can or should be made. Of course, we personally have to make them. No one else can do that for us, but failure to make adjustments to change can effect us. The old adage is that a change at the core is worth more than any amount on the periphery. The analogy I hold close on this subject is that of a sphere. We can endlessly travel on the surface of a sphere (like Earth), but we will never get any closer to the center. This is what the Tibetans call relative truth, something my dharma teacher explained to me many years ago in reference to the value of astrology. Of course, the Tibetan use astrology all the time, but even so, Rinpoche said that astrology (like all relative truths) can but help us get from here to there, just as we go from Detroit to New York on the Earth's surface. And this relative change may (or may not be helpful), but regardless it is relative only. By moving on the surface we can perhaps improve our situation. That is the value of astrology, geomancy, tarot, and any number of other oracles, and this is not meant as a put-down. After all, I have spent most of my life as an astrologer, so I do value and use it all the time. That being said, Rinpoche pointed out to me that astrology (his words) was one of the limbs of the yoga, a relative truth. But, he went on to say, it is not the root or absolute truth. Only the dharma and its path lead inward toward the center of the sphere and are not relative truths, but are "absolute" truths. From the center of a sphere the entire surface can be viewed and is made practical. Now, this is just an analogy, but in my opinion, a pretty good one. Getting back to these eclipse alignments, when they occur, things can free up, and we have the opportunity to make inner changes at a core (or toward the core) level, and the results can be much more powerful than just changing course at the surface. I don't want to push this analogy too far, but for me, it has been very, very useful. Change at the core level is not the same as change at the surface level. Eclipse alignments and intense solar activity (in my experience) allow for changes to be made at the core level. We can creatively take part in making these changes or they can (and will) be made for us.